Masks, Props and Costume . 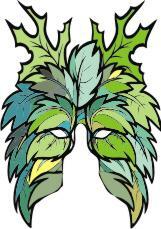 . .
Costume, props and masks . 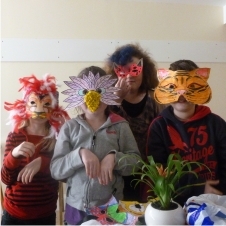 . .
Dressing up, putting on masks, make-up and using props are all very important parts of acting, but they are also great fun. COSTUME is sometimes a luxury in theatre. 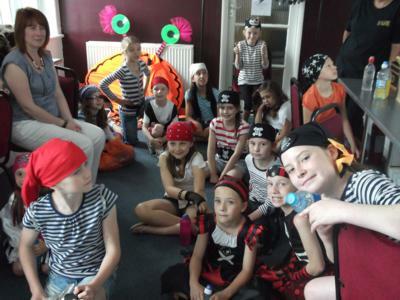 To be convincing as a character an actor doesn’t need to use a costume, however it can help students remember that they are ‘in character’. To do this a costume doesn’t have to be complicated: a simple hat, cloak or scarf is often sufficient. Even the use of name badges or masks remind students who is playing who. Using costume is something JGDATA uses often as this tool is a great source of understanding, especially for our younger students. 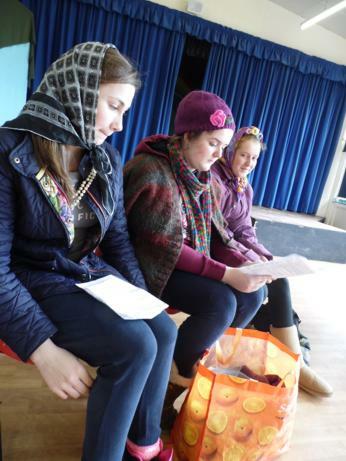 PROPS are very useful, although there is no need to use them in acting. It does sometimes help a student to have a few simple items to use and can provide something for students to do with their hands. Props are a great way to indicate who the characters are being performed. (eg. A crown for a king, a sword for a soldier or a Bible for a priest). Props can be anything an actor uses, including other actors. It is often useful to have a few pieces of furniture available (a couple of chairs for example) that can form the set and give a bigger picture to the piece being performed. Masks are a very quick way of putting an actor into character. 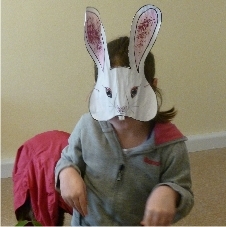 Children relate very quickly to the character they are asked to play when wearing a mask and JGDATA like using masks within our rehearsals and performances. 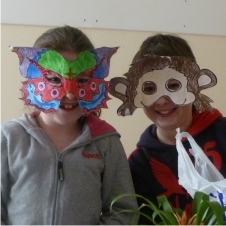 Creating a mask is just as much fun as wearing it, it also becomes very individual to the student and gives them ownership. In Character . . . 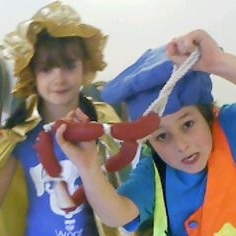 SHOOTING Stars Students using costume and props in their rehearsal for Wonderland. MEGA Star student in costume and makeup to get into character. 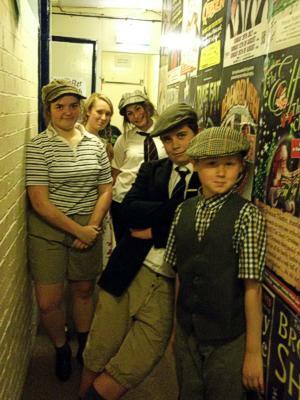 MEGA Stars Students in costume and makeup just before going on stage at the Princess Theatre in Hunstanton. 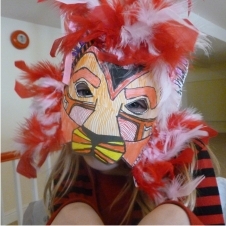 You can download our FREE mask blanks below, decorate them and use them in play - or create your own and bring them with you to rehearsal for all to see, admire and watch as you become the character. All our masks are FREE. Please print off as many as you like . . . The greatest and funniest Circus act - the clown. 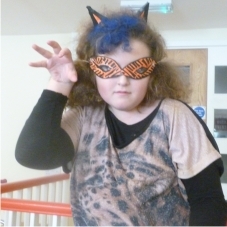 Create yours with bright colours and add glitter, beads, streamers and fur. Some animals can be found in the Circus, some in the zoo, while others only exist in our imagination. Create yours with bright colours, adding glitter and string, wool and fur. Here is a collection of human faces, some wild, some relaxed and some unusual. All can be used in drama for characterisations. Here are a few aliens. The great thing about make believe characters is only you can make them truly come to life. Try to decorate your alien with lots of extra bits, like fluff and glitter, stars and string. Here are a few mythical creatures that can be used in many plays. From forest sprites to great ogres, these masks make it possible to be a character from fairytale stories and wonderlands. 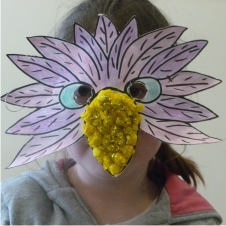 Try adding leaves and sticks to your mask to make them realistic.